In November 2012, I traveled to Canada to speak at the Ontario Lavender Conference. During this two-day gathering, I discovered a vibrant, inspiring and collaborative community of lavender enthusiasts. Ontario’s lavender industry grew out of a small study group formed in 2003. Later in 2010, it blossomed into the Ontario Lavender Association. During this time, Ontario’s farmers were seeing a shift impacting farming opportunities. Tobacco, which had been Southern Ontario’s leading horticultural cash crop, diminished. Demand plummeted due to health concerns, cigarette taxes and new government policies. In 1970, 3,000 farms grew tobacco in Canada; today the number has dropped to about 650. Fruit orchards, burdened with high labor costs, struggled to compete with growers around the world. Prices dropped and income dwindled. Raising hogs no longer supplied enough revenue to cover costs. The situation was clear. Some families who had farmed their land for generations needed to cultivate new crops. Farmers transitioned into various horticultural crops including grapes, a wide range of vegetables and other fruit crops. Some Ontario farmers shifted to growing lavender. These farmers imagined a new industry. One that would use lavender in an array of value-added products such as soap, shampoo and seasonings, and at the same time attract tourists to visit their lavender fields during the summer bloom. Revenue would come from farm boutiques, tours and on-line shops. However, before purchasing and planting thousands of lavender plants, the growers wanted to feel confident that their plants would survive Ontario’s cold winters. To discover which kinds could survive the winter, a trial tested 27 varieties at six sites in southern Ontario. Additional testing would evaluate lavender varieties to rate their visual beauty, oil quality and content and bloom time, for example how many weeks the bloom endures. Chaired by Anita Buehner, who is co-owner of Bonnieheath Lavender, the Ontario Lavender Association obtained a research grant from the Sand Plains Community Development Fund. The money would fund research to find suitable lavender varieties for Ontario’s growing conditions. Growers who hosted the trials paid the cost of the plants; and the University of Guelph, the Ontario Ministry of Agriculture, Food and Rural Affairs (OMAFRA) and Erie Innovation and Commercialization provided support. Growers, government ministries, industry associations and academia, all worked together to launch Ontario’s lavender industry. Seventy-four people went to the conference. Attendees included growers, artisans, and research professionals. Most participants came from Canada; however several growers traveled from Michigan, New York and Pennsylvania to learn about Ontario’s lavender experience. Mary Tate Bergstrom represented the United States Lavender Growers Association. When I read about a banquet with “lavender-inspired culinary delights,” I was intrigued. Lavender played a leading role in the menu. Green salad served with savory dressing demonstrated lavender’s ability to accentuate the fresh flavor of vegetables. The main course, chicken, mashed potatoes and cauliflower, combined many flavors. Herbes de Provence, a blend of herbs such as lavender, rosemary, basil and thyme, seasoned the potatoes perfectly. The finale, mixed berry trifle with lavender-infused cream, silenced the room as diners relished the flavor. Pat Earls, an Ontario Lavender Association member and owner of Lavenders of Norfolk, created the recipes, and the chef received kudos for his preparation. This banquet not only exceeded my expectations, it provided positive proof of lavender’s culinary versatility. (Thank you to Pat Earls for sharing her recipes and giving me permission to share them on my blog: Lavender Salad Dressing, Herbes de Provence Mashed Potatoes and Lavender Berry Trifle. After dinner I gave the keynote presentation, “Lavender Business Models from around the World.” Farms I featured included:Ali’i Kula Lavender, Bridestowe Estate, White Oak Lavender Farm, Forest Green Man Lavender, and Becker Vineyards. Each of these farms exemplifies successful agri-tourism strategies. The next morning I talked about the culinary connection. My topic was how to use culinary lavender to stir up profits. As a foodie, I especially like to discuss flavor combinations. This presentation generated a good discussion. Questions ranged from “Can lavender stems be used in cooking?” to “Have you experimented with hydrosol to flavor food?” I can’t wait to try these ideas, and when I do, I will post the results on my blog. On the drive to the airport for my flight back to Seattle, I felt honored to have been a speaker at this event. I’d met new lavender growers, and I was inspired by their resilience and enthusiasm. I don’t know whether lavender will replace the income lost from tobacco, fruit and hogs; however I do know the Ontario growers will transform their region into purple fields of lavender in the summer season. I am already planning my return to Ontario; but my next trip will be in summer when lavender will be in full bloom. Early August is when I met Cece. I was visiting the St. Johns Farmers Market on a Saturday afternoon. 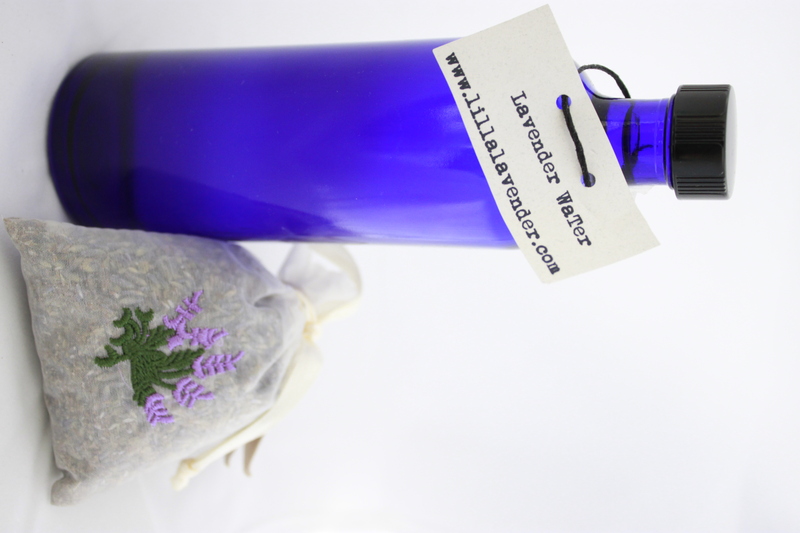 When I spotted the booth with the banner “Lilla Lavender”, I went right over to see what they were selling. Cece and her husband Ray were busy talking with customers. During a lull in the steady stream of customers occurred, I took the opportunity to introduce myself. Cece asked me about my interest in lavender. “I wrote a cookbook called “Discover Cooking with Lavender” and I’m here today to sign books at the St. John’s Booksellers,” I explained. As we continued our conversation about cooking with lavender, Cece asked me how I make Lavender Syrup. “I take a cup of water, a cup of sugar and 1 tablespoon of dried lavender buds, blend them in a small sauce pan and…..,” I went on. I knew lavender water was a byproduct of the distillation process. Lavender plant material including both leaves and flowers are harvested and cooked in a large container. The heat and steam cause the plant’s glands to erupt and release their essential oils. Because the oil is lighter than water, when the steam condenses, the oil rises to the top and separates from the water. The remaining water is known as Lavender Water or hydrosol. Hydrosol is frequently used to spray on sunburns, to add to your bathwater or to soothe an itch. This was the first I heard of using it to cook with. I was intrigued. I added 2 ounces to a cup of water and poured it over ice. The drink was too strong, it tasted bitter. I guess I overdid it with the lavender. The next drink I made I used 1 tablespoon with 1 cup of water, poured it over ice. This time it was just right. When I do make syrup, I will use with these proportions: 1 cup water, 1 tablespoon lavender water and 1 cup of sugar. Thank you, Cece! Discover cooking with lavender has taken on a new meaning since I met you.